High-speed rail (HSR) is a type of passenger rail transport that operates significantly faster than the normal speed of rail traffic. Specific definitions by the European Union include 200 km/h (120 mph) for upgraded track and 250 km/h (160 mph) or faster for new track. In Japan, Shinkansen lines run at speeds in excess of 260 km/h (160 mph) and are built using standard gauge track with no at-grade crossings. In China, high-speed conventional rail lines operate at top speeds of 350 km/h (220 mph). The world record for conventional high-speed rail is held by the V150, a specially configured version of Alstom’s TGV which clocked 574.8 km/h (357.2 mph) on a test run. 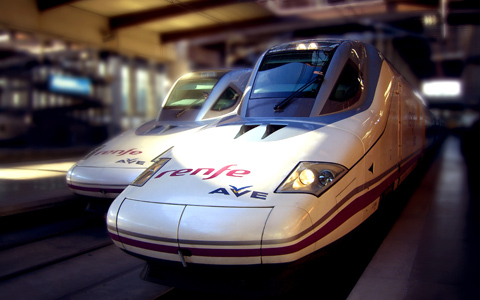 There are a number of different definitions for high-speed rail in use worldwide and there is no single standard, however there are certain parameters that are unique to high-speed rail. UIC (International Union of Railways) and EC Directive 96/58 define high-speed rail as systems of rolling stock and infrastructure which regularly operate at or above 250 km/h on new tracks, or 200 km/h on existing tracks. However lower speeds can be required by local constraints. A definitive aspect of high speed rail is the use of continuous welded rail which reduces track vibrations and discrepancies between rail segments enough to allow trains to pass at speeds in excess of 200 km/h (120 mph). Depending on design speed, banking and the forces deemed acceptable to the passengers, curves radius is above 4.5 kilometers, and for lines capable for 350 km/h running, typically at 7 to 9 kilometers. There are also a number of characteristics common to most high-speed rail systems but not required: almost all are electrically driven via overhead lines and have in-cab signalling as well as no level crossings. Advanced switches using very low entry and frog angles are also often used. KTX-Sancheon, a South Korean high-speed train at Seoul Station. Much of the technology behind high-speed rail is an improved application of mature standard gauge rail technology using overhead electrification. By building a new rail infrastructure with 20th century engineering, including elimination of constrictions such as roadway at-grade (level) crossings, frequent stops, a succession of curves and reverse curves, and not sharing the right-of-way with freight or slower passenger trains, higher speeds (250–320 km/h) are maintained. Total cost of ownership of HSR systems is generally lower than the total costs of competing alternatives (new highway or air capacity). Japanese systems are often more expensive than their counterparts but more comprehensive because they have their own dedicated elevated guideway, no traffic crossings, and disaster monitoring systems. Despite this the largest of the Japanese system’s cost is related to the boring of tunnels through mountains, as was in Taiwan. Recent advances in wheeled trains in the last few decades have pushed the speed limits past 400 km/h, among the advances being tilting trainsets, aerodynamic designs (to reduce drag, lift, and noise), air brakes, regenerative braking, stronger engines, dynamic weight shifting, etc. Some of the advances were to fix problems, like the Eschede disaster. European high-speed routes typically combine segments on new track, where the train runs at full commercial speed, with some sections of older track on the extremities of the route, near cities. In France, the cost of construction (which was €10 million/km (US$15.1 million/km) for LGV Est) is minimised by adopting steeper grades rather than building tunnels and viaducts. However, in mountainous Switzerland, tunnels are inevitable. Because the lines are dedicated to passengers, gradients of 3.5%, rather than the previous maximum of 1–1.5% for mixed traffic, are used. Possibly more expensive land is acquired in order to build straighter lines which minimize line construction as well as operating and maintenance costs. In other countries high-speed rail was built without those economies so that the railway can also support other traffic, such as freight. Experience has shown however, that trains of significantly different speeds cause massive decreases of line capacity. As a result, mixed-traffic lines are usually reserved for high-speed passenger trains during the daytime, while freight trains go at night. In some cases, night-time high-speed trains are even diverted to lower speed lines in favour of freight traffic. HSR, like any transport system, is not inherently convenient, fast, clean, nor comfortable. All of this depends on design, implementation, maintenance, operation and funding. Operational smoothness is often more indicative of organizational discipline than technological prowess. 1- Displaced usage from more environmentally damaging modes of transport.